Probably the thing that takes the most amount of thought before I leave for any bike trip is what I’m going to bring with me and how I’m going to pack it all. 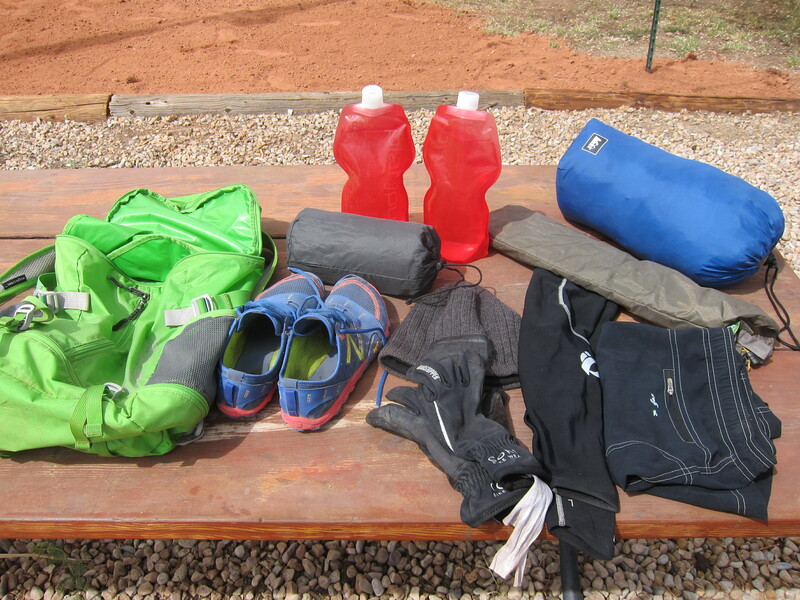 And as I was biking through Utah, it was the question that people most often asked me: what do you have in all those bags? So that’s how it looked with everything packed up. It came down to this: two panniers, one extra bag strapped on top of my rack, a little saddlebag with my tools, a frame pack, and my handlebar bag. It weighed sort of a lot, but once I was biking the weight didn’t really matter, since as long as it was even remotely well-balanced, all it did was make me slower going uphill. Now as for what was inside all those bags. So this pannier was the heaviest one. The grey stuff sack was filled with food: dehydrated dinners (bought in bulk at People’s Co-op in Portland), oatmeal, nuts, dried fruits, energy or granola bars, veggies, whatever I happened to have on hand. The weight and bulk of that varied according to how much food I had at any given time, but other than water, food was probably my heaviest thing. Aside from food, I stuffed most of my clothes in this bag. From the top left, I have one short-sleeve shirt (I’m wearing the other one), booties, long underwear, one sports bra, three pair wool socks, one pair normal pants, two pair underwear, two pair biking bottoms (one shorts, one 3/4 length), and my water-resistant layer. Plus, to take this picture, I was wearing (aside from the short-sleeve shirt I mentioned), a sweatshirt, another pair of socks, some shorts, and long underarmor. I did have some other clothes-type stuff too, but I put that in different places. This pannier was much more scattered. My sleeping bag took up most of the room, but stuffed in around it I had most of my pragmatic things as well as my entertainment things. From the left, I had my puffy down jacket (so glad to have had that on this trip!) as well as a quick-dry towel. The rolled-up blue thing by my puffy is my water filter. I didn’t use that too much, so I was glad I brought this super small and sort of annoying one instead of my usual MSR pump filter. In a plastic bag, I have a spare tube, a pink rag, and lube for my bike. Underneath that, my headlamp. Next to that, and this is a weight extravagance for sure: my maps, my journal, and two whole books. Above my literary stockpile is my Jetboil, which is how I made anything warm to eat or drink (the fuel cannister for that fits into the Jetboil itself). Then I have a bunch of little things. A stuff sack with my camera and cell-phone chargers, plus four extra rechargeable AAA batteries. An orange stuff sack into which I put all my toiletries: biodegradable Dr Bronner’s soap, toothbrush and toothpaste, rudimentary first aid (consisting mostly of neosporin and bandaids), chamois cream, toilet paper and baby wipes. The black square thing next to my sleeping bag is actually some leg warmers that I’d cram around everything else if it wasn’t cold enough to wear them. This was a fun one. The green bag is just some cheap Eagle Creek bag I bought at REI–it was convertible between a duffel bag and a backpack, but since I wasn’t going to be using the duffel function, I just cut off the straps for that. But why I liked it is because I could take it off my bike and use it as a backpack for dayhikes, but when it was on my bike, I could zip the straps into a compartment and get them out of the way. It was also the bag I used as a carry-on when I flew to Grand Junction (I checked my panniers in a giant duffel bag). Anyway, this bag carried another random assortment. The blue stuff sack is my tent; the long bag underneath it is the poles and stakes. 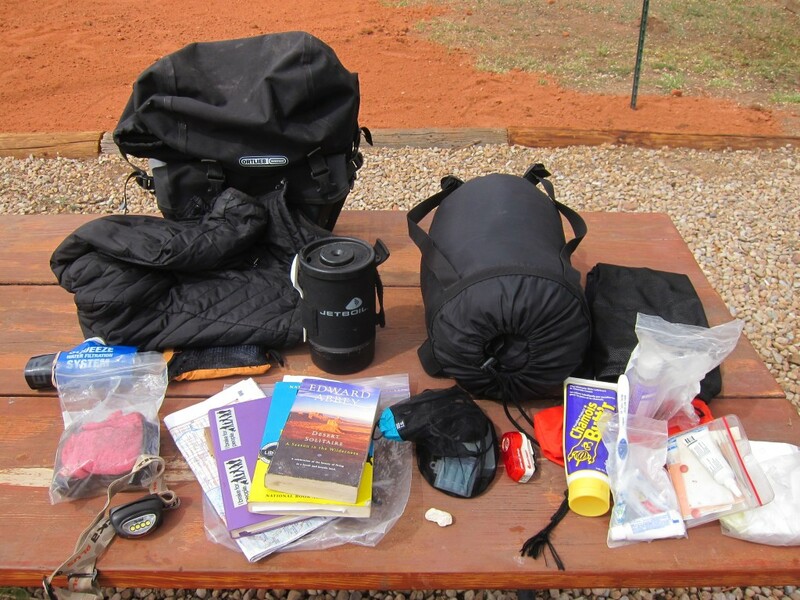 I liked having those in this bag because then my shelter was super readily accessible when I stopped to set up camp, without having to dig through all the stuff in my panniers. The other stuff sack is my sleeping pad, a NeoAir that I splurged on before I left because it packs up so darn small and light. 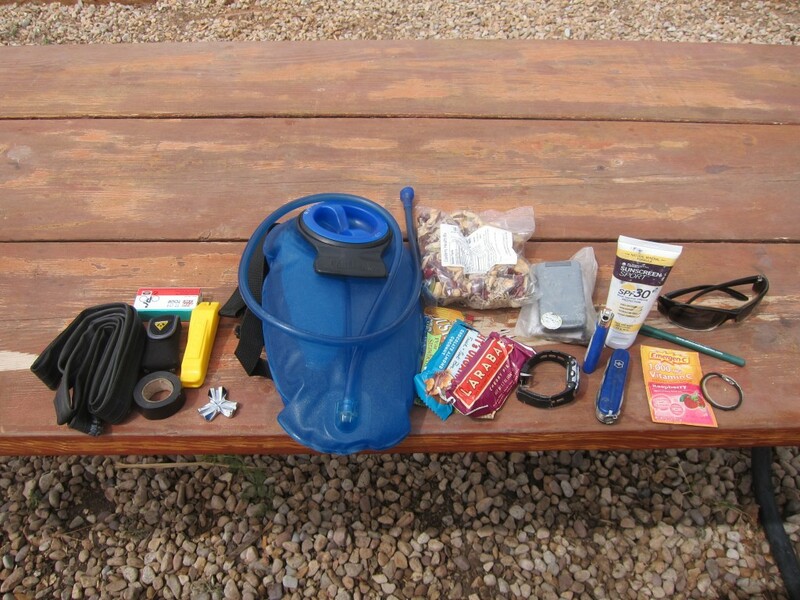 Then I’ve got two collapsible liters of water storage–I’d fill those if it would be a long time between watering holes and leave them empty if I didn’t need them. 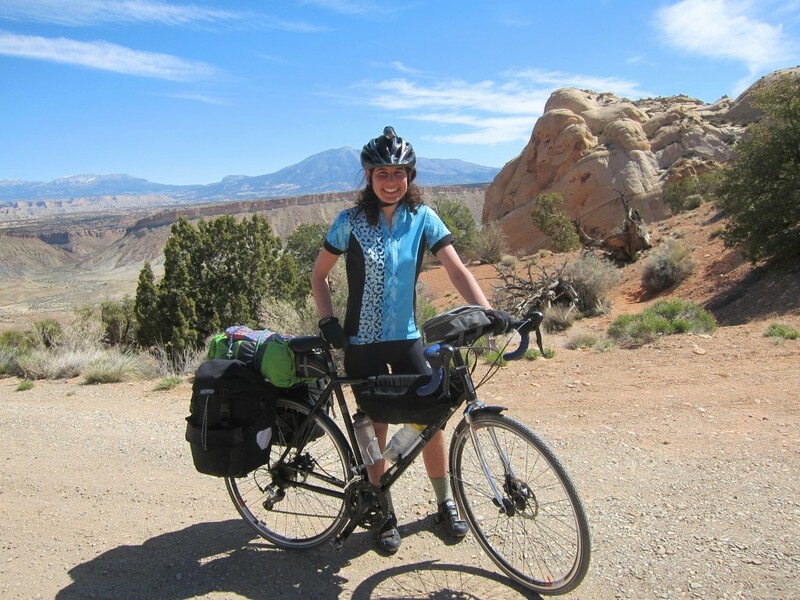 I put layers that I thought I’d want super accessible on top–my beanie, gloves, arm warmers, and some baggy shorts I’d pull over my bike shorts when I stopped in towns where I thought spandex might not be appreciated. My hiking shoes (really just old, dead running shoes) fit right on top of the bag but strapped under the bungee cords for super easy access. 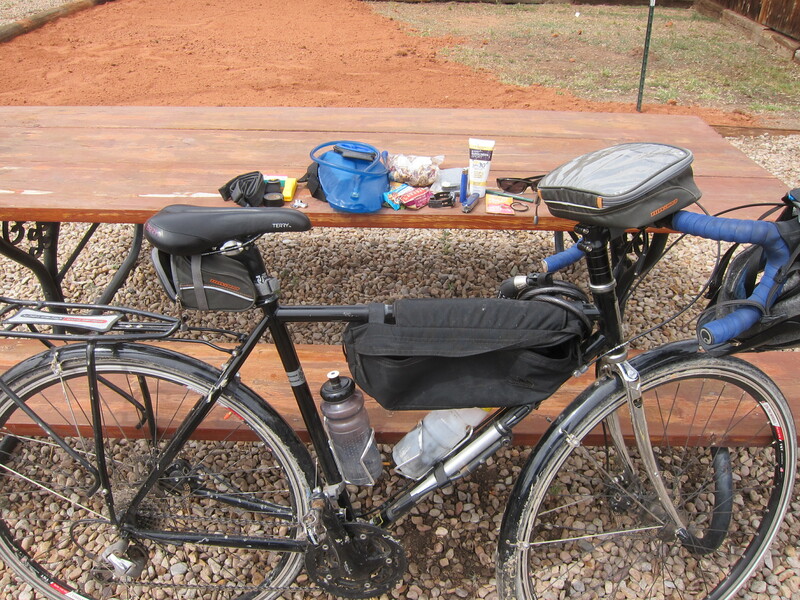 My saddle bag was just for tools: another spare tube, electrical tape, patch kit, tire levers, multitool, and spoke wrench. The frame pack held two more liters of water (I always kept that one full–yknow, until I drank it) and, annoyingly, a shoulder strap for one of my panniers that I hadn’t meant to bring with me but forgot to take out of my pack. I also kept any trash I had in there, easy access for throwing it away whenever I came to somewhere with a garbage can. My handlebar bag was for snacks and other things I wanted super easy access to: sunscreen, pocket knife, lighter, watch (the band broke, so I just kept it in my bag instead of on my wrist:), hair ties, sunglasses, lip balm, cell phone, and money. And that was everything I had! I probably had more clothes than I needed. 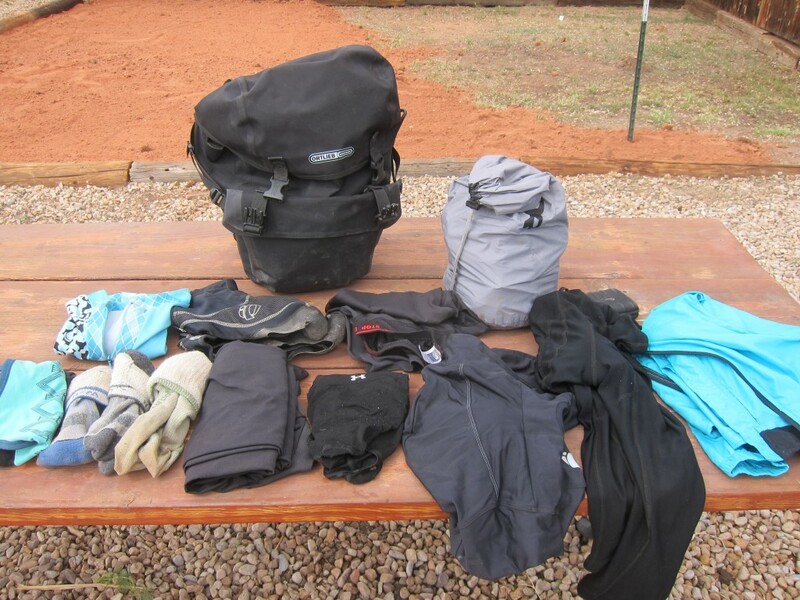 The underarmor, for example, was sort of redundant with the leg warmers, and I probably could have done with two pairs of socks–but clean socks is such a luxury for me when I travel that I made room for them:) And my tent, which is a two-person tent, is bigger than I really need. But mostly, I had exactly what I wanted and exactly enough–a great feeling. After a few days, I figured out my packing scheme so that I always had everything in the same place–that not only made it easy to find things when I wanted them but also kept me from leaving anything behind, because it would be super obvious to me if I was forgetting anything. So, with all your gear, how much does the bike weigh? Wonder how you’d fare by stashing the same amount of stuff into 4 instead of 2 panniers, thus lowering the center of gravity on the bike. I like the idea of not having all the weight over the back tire, though–it probably would have made handling on all the dirt/gravel roads a little easier.